As you walk beside the lake on a cloudy night, a curious, organic artifact falls from the starry sky and inexplicably, without asking permission, transports you across the universe. You’ve been abducted from your cozy existence and added into an alien landscape with pieces of Earth from unexpected times and places. For 25 years, Cyan has been developing games that create a sense of immersion, a sense of presence, a sense of wonder. VR enables Cyan to elevate its craft to a whole new level. 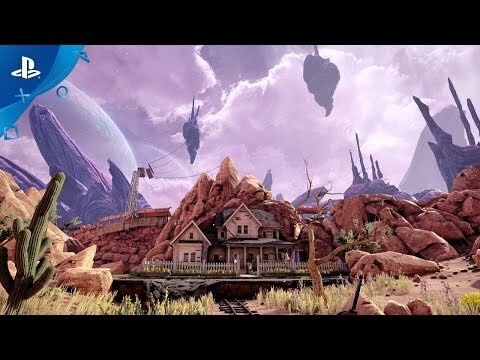 Built in Unreal Engine 4, Obduction has a stunning visual aesthetic. Its imaginative worlds drive a player’s desire to explore, observe and discover. Obduction © Copyright 2016 / 2017 by Cyan, Inc. All rights reserved. Obduction and Cyan are registered trademarks of Cyan, Inc.